Okay, one more day and you won't have old PuzzleGirl to kick around any more! Until, ya know, the next time I fill in for Orange. But anyway. I was debating whether to write this up tonight or to try to get some sleep first and blog in the morning. I'm still dragging from my road-trip/concert/autograph-seeking experience last night. Like I said yesterday, I'm definitely too old for that stuff. But ya know what? At least this time I only lost my sunglasses. Back in the old days I used to lose my car. I kept thinking [The loneliest guy in town] was a song lyric (and it probably is; if it's not, it should be) but it's the old MAYTAG REPAIRMAN's description. One who [Handles things evenhandedly] can be said to STRIKE A BALANCE. Viking stories, e.g. are [NORSE LITERATURE]. And [Bedazzlement] can be described as having STARS IN ONE'S EYES. But look at the crosses! I'm sure YEREVAN isn't universally known, but it's totally fair. 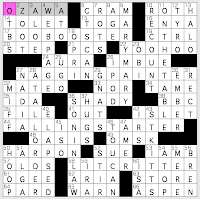 I thought A-OKAY looked funny spelled out but it gets an awful lot of Google hits and I'm thinking maybe I've seen it shortened to AOK so many times in puzzles that the actual standard way of spelling it seems foreign to me. And, come on ... P. T. BARNUM? That's an awesome entry! And the PAVILION / LESOTHO / SIMEON pile-up is a thing of beauty. I liked the cute clues for DEANS, [Ones in control of their faculties? ], and HONOREE, [Center of a roast]. Really the only trouble I had was spelling [Mother of the believers] AYESHA. I have a friend with that name who spells it Aeesha, so I had to think about whether able works for [Well]. Answer: It doesn't, but ABLY does. I was about to say that if you [Yielded to a deadly sin] and LUSTED for dessert, that might be problematic—but nah, no such thing as lusting for dessert being a sin. Now if the indulgence verges on gluttony... Well—that's between you and your comfort zone! While it may not be the best source for theological discourse, this Wiki backgrounder on the seven deadly sins is quite good and to the point—especially for the information it provides on their 4th century origins as "eight evil thoughts" (delineated by monk Evagrius Ponticus) and their 6th century revision by Pope Gregory I into the sins we know and love. What I do like about BOTOX is that "X" at the end. If you take a careful look around the grid, you'll also see that Patrick's given us a pangram today. Every letter of the alphabet makes at least one appearance. With a nod to the way children learn to chant the alphabet, we even get XYZ clued as [Grade school recital's finale]. 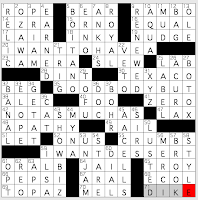 The sense of the word "recital" made the clue hard to parse—and I think that was intended. We're looking for something that's recited, and not a musical presentation. Btw, this puzzle contains two Xs, four Ys and three Zs. Let's hear it for the end of the alphabet! Brendan Emmett Quigley's blog puzzle, "Superhero Rejects"
the [Antihero who keeps firing sidekicks?] is HATCHET MAN. the [Crimefighting quintet of potheads?] is the HIGH FIVE. [Totally unpredictable heroes?] are the WILD CARD TEAM. [The League of Extraordinary Nitpickers?] are the CONTROL GROUP. great base phrase here, from experimental science. science! [Masked avenger who's a total wuss?] is MAMA'S BOY. yeah, that would be a pretty lame superhero. [Superhero who can't keep her mouth shut?] is GOSSIP GIRL. never seen the show (it's a show, right?) but ... yeah, i could imagine such a superhero. stuff i loved from the fill: science! the [First Law of motion subject] is INERTIA. my summer physics students are taking their final exam as we speak. [Jupiter feature] is the great RED SPOT. not sure how wonderful this is without "great," but ... i'm an easy guy to please. i love the colloquialism "SPOT-ON!" (["Exactly!"]). [Action flick that takes place in the Nakatomi Plaza] was an utter gimme for me: DIE HARD. my wife and i were just talking about how amazingly well that movie has held up. alan rickman is just brilliant as hans grüber, and i think this was when hollywood realized that great acting from the bad guy could actually carry an action flick. and brendan's got a funny self-referential clue at 1a, [Like me in a couple years]: BALD. say it ain't so, bro. 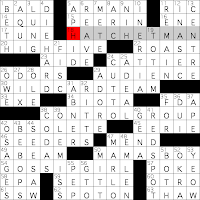 Annemarie Brethauer's Chronicle of Higher Education crossword, "Lines Man"
the chronicle recently changed their site layout, and although the crossword is finally back on their website, it's in a different place. most places where people get their puzzles (like cruciverb and ephraim's puzzle pointers and wij's puzzle pointers) haven't changed their links. 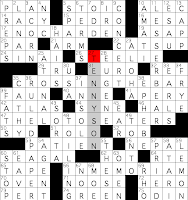 well, here's the crossword page, and you can download today's puzzle there. it's a tribute puzzle to the "lines man" of the title, alfred lord TENNYSON, the [Man who penned this puzzle's lines, born August 6, 1809]. that's 200 years ago. same year as darwin and lincoln (remember that? ), though not on the same day. so what are those lines? "Now when the dead man come to life beheld / His wife his wife no more" is from ENOCH ARDEN. i know the title, but i haven't read this poem. and frankly, i can't understand what the hell those lines mean. parsing error. "Sunset and evening star / And one clear call for me!" is from CROSSING THE BAR. this one was a gimme, as it's the opening lines of a (justly) famous poem. in an elegant touch, this entry and the next both intersect TENNYSON in the grid's center. 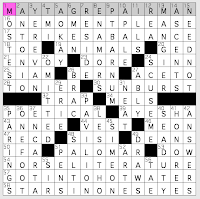 as a result, the grid had to be expanded to 16x15 (since TENNYSON is even-length). "O, rest ye, brother mariners, we will not wander more" is from THE LOTOS EATERS. i wonder if the seattle mariners say this to each other at the end of a long road trip. "'Tis better to have loved and lost / Than never to have loved at all" is from IN MEMORIAM, tennyson's brilliant tribute to his friend arthur henry hallam. famous lines indeed, but i actually had forgotten that they were from this particular poem. so, a nice tribute. the only thing that could have made it better would have been the inclusion of Ulysses, my favorite tennyson poem. but i understand that it didn't fit into the grid as an unpaired 7.
the fill was pretty smooth. i did like the mythological bent (i can hear you all gasp in surprise): in addition to THE LOTOS EATERS (which is tennyson's riff on a section from the odyssey), ATLAS is clued very cleverly as [Strong supporter? ], and ODIN puts in an appearance as well. unfamiliar greek word: EPHEBE, clued as [Youth of ancient Greece]. is this a singular or plural noun? common or proper? i can't really tell. Surprise! I’m baaaack. It’s Jeffrey Krasnick filling in for PuzzleGirl filling in for Orange. Yes, finally an accountant blogging the Wall Street journal puzzle. But we’re in the marketing department, not accounting today. This one by Patrick Berry is called “Product claims (Disproved)” or perhaps, Famous Last Words. 23A: [Disproved! It hung on me like a sack!] – ONE SIZE FITS ALL. I am nearly 6’4”. Nothing one-size ever fits me. 28A: [Disproved! I spotted it at Wal-Mart!] – NOT SOLD IN STORES. That’s like the “As Seen on TV” you have in U.S. malls that sells all the stuff they claim you have to order. 42A: [Disproved! They have a whole warehouse of ‘em!] – SUPPLIES ARE LIMITED. Why ‘em? YM? YMCA? 69A: [Disproved! I wasn’t!] – YOU’LL BE AMAZED. 91A: [Disproved! There was more than one part!] – NO ASSEMBLY REQUIRED. Got an email from the cable company yesterday, saying I had to trade in my old modem for a free new model. Went to the office, stood in line with half the city, got the new one. They said just hook it up, five minutes to set up. Two hours of frustration later, I’m on the phone with them. While I’m on hold (of course), the recording goes, “Try unplugging and replugging the modem”. Tried it. Worked. 111A: [Disproved! Aunt Rose returned it for store credit!] – MAKES A GREAT GIFT. Anyone want an old modem? 119A: [Disproved! It’s the same old piece of junk it always was!] – NEW AND IMPROVED. Anyone want a new modem? Cool puzzle. Nice eight-letter stacking of two sets of theme answers. 50A: [Saskatchewan native] – CREE. Canadian content! I’m heading CrossCan next week to see my newborn niece or nephew. Or to see my overdue sister-in-law. One or the other. 53A: [Kitt who played Catwoman] - EARTHA – Batman reference! I’m wearing a Batman watch right now. 76A: [The Fonz, for one] – GREASER – Ayyyyyyyyy! Grease video for PuzzleGirl. 126A: [Canadian alphabet ender ]– ZED. Canadian content! 71D: ["Mule Train" singer] – Frankie LAINE. 78D: [Susan’s portrayer on “Desperate Housewives” – TERI. As in Hatcher. She also played Lois Lane in “Lois and Clark”. Dana Delany is in “Desperate Housewives”. She did the voice of Lois Lane in many animated versions of Superman. 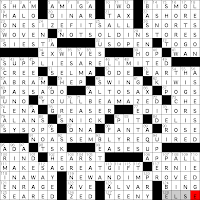 puzzlegirl had to run off to her doctor/airport/what-have-you, so she asked me to post the grid and link to her writeup at LA crossword confidential. i refused, of course. what am i, some kind of lackey?